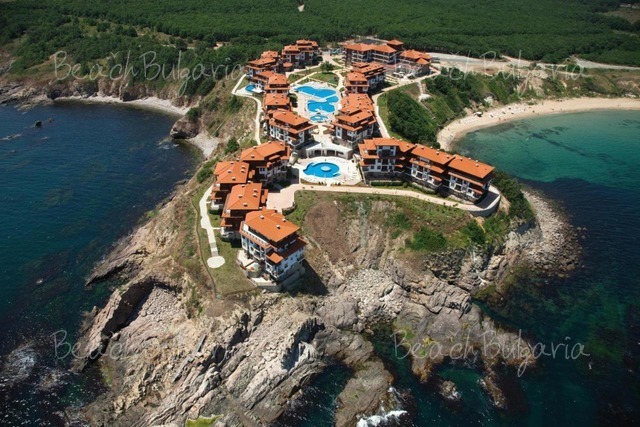 Saint Thomas hotel is situated just 700 m from Arkutino natural reserve, right on Humata cape. 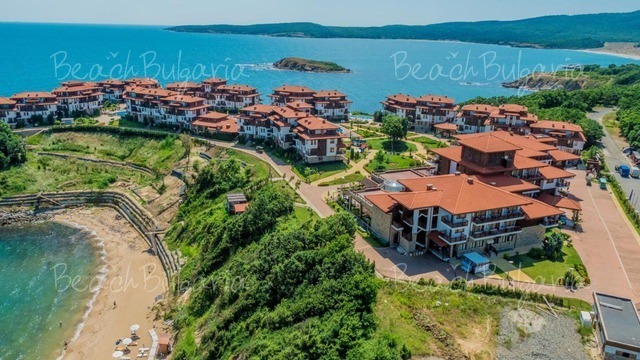 Saint Thomas Holiday Village is situated right on the beach at the Black Sea Coast 12 km south of Sozopol's Old Town, 50 km south of Bourgas airport, 12 km south of Sozopol, 2 km south Duni resort and 12 km from Primorsko. The complex features 48 double rooms, 11 one-bedroom suites and 1 presidential suite. All rooms feature a balcony, a bathroom with a hairdryer and toiletries, and a TV with satellite channels, free Wi-Fi internet. Lobby Bar with 50 seats and variety of cocktails, drinks, pastries and deserts. 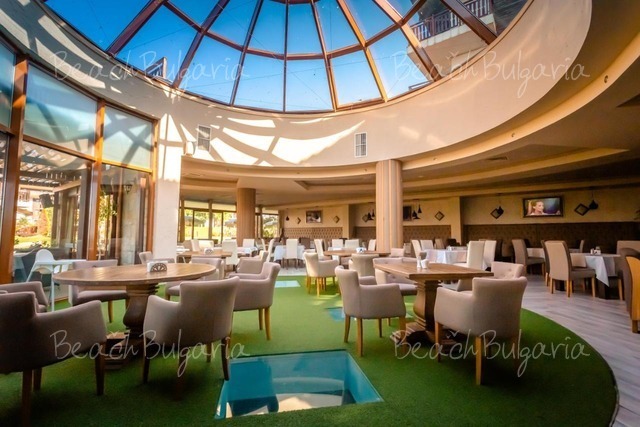 The restaurant is situated in Karina hotel. It features two halls with 45 and 120 seats, an open terrace with 50 seats and with a sea view. 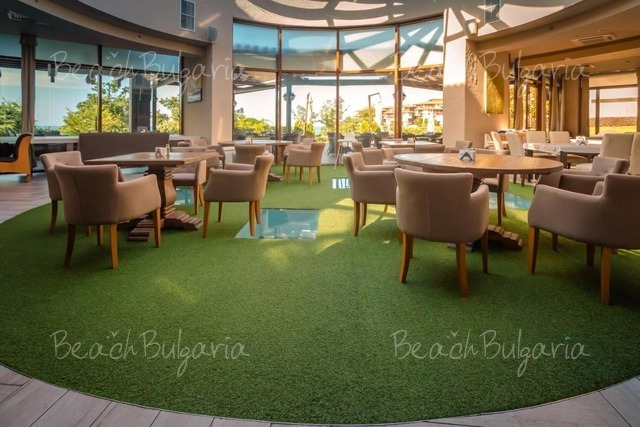 The restaurant serves dishes from Bulgarian and international cuisine. Beer House Viking located on two floors, next to the swimming pool area. The menu consist of grill dishes, fast dishes, pizza, fish dishes. Beach bar Arkutino - The bar is set on Arkutino beach and serves fast dishes, salads, pizza, grilled dishes, cocktails. The bar offers DJ nights. The spa centre features a hot tub, a sauna, a steam bath (for extra charge). The complex offers also a beauty parlour, a fashion store, a mini market. 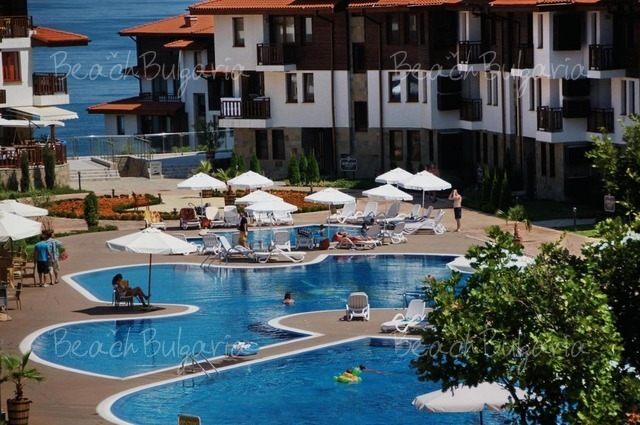 The property offer 5 swimming pools, one of them is swimming pool for children. Saint Thomas holiday resort offers 2 multi functional halls with 50 seats each and a hall for 150 guests. The halls are excellent conditions for business conferences, team buildings, weddings and different kinds of ceremonies. * The rates are in Euro, per room/apartment, per night, all inclusive. 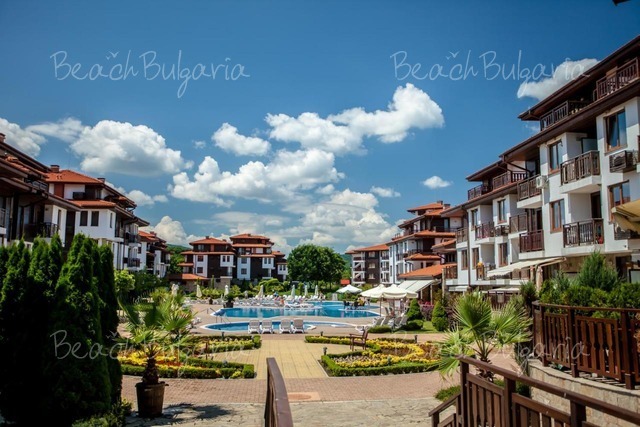 Guests of the hotel can use swimming pool, parasole and sunbeds on the swimming pools and on the beach, fitness, parking lot, internet, Children's entertaining programs, kindergarden, kid's animation, daily transport to "Arkutino beach". * Maximum capacity: Double room - 3 adults or 2 adults + 1 child; 1-bedroom apartment: 2 adults + 2 children or 3 adlults; 2-bedroom apartment - 4 adults + 1 child or 5 adults. * Cancellations can be made free of charge providing details of this are received at least 16 days prior to check-in time on the day of arrival and 21 days during 01 July - 31 August 2019 - cancellations made after this period will incur a fee equivalent to the cost of 3 night's accommodation. My wife and I and small dog were walking past Saint Thomas Hotel yesterday 4.7.11 when your guard dog broke loose and savaged our dog, and myself I was badly bitten on the arm, scratched on my body.My wife also knocked to the ground and scratched.It took three saint tomas guards to hold the dog down, and to stop the rotweiler from attacking us futher, at this point our dog was held in the rotwielers mouth.To stop the rotwieler I had to hit it twice on the head with a concret brick which was on the floor, had this not been there I don,t know what the out come would have been.Many thanks to the hotel doctors and all who saved us. Excellent location, perfect for quiet holiday. However, braking into apartments is very common, stealing from cars at the FREE parking place is an every day thing. So if you do not have a car you are fine. If you go there you have to demand an apartment at the villa places with CTTV , otherwise noone takes responsibility for the breakiing in. Police is practically non excistent, since they will do NOTHING. Beware of the hotel Manager - Mrs. Nenkova. I advise no direct contact. The woman needs to get acquainted with good conduct practises. Nice location is not sufficient, good management should be part of the package as well. Sadly, it is not. Please, post a comment on Saint Thomas Hotel. The hotel is a perfect harbor of quite, peace and relaxation. 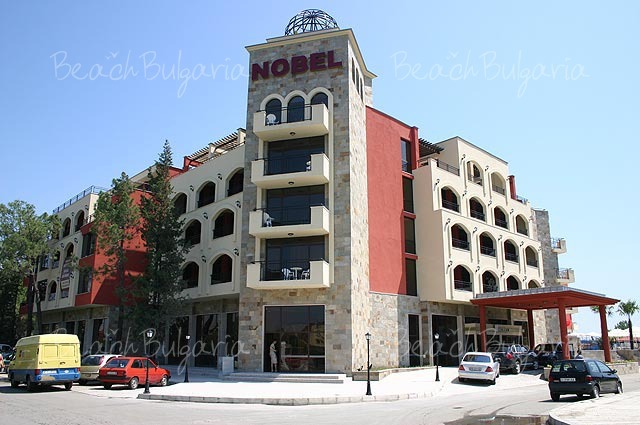 Arrival wasnt too great as the hotel reception didn't know who Beach Bulgaria were. Once the correct room was sorted out things were fine, although bed was under an Air Conditioning unit which dripped onto our faces - moved bed as hotel didn't appear interested in sorting out the drip. Complex is really spacious, and selection of pools great.